For most of human history, the world didn’t change very quickly. Until the 1700s, kids could largely expect their lives to be similar to their parents, and that their children would have an experience very similar to their own, too. There were obviously changes in how humans lived over longer stretches of time, but nothing that even different generations could easily observe. My first introduction to science fiction was Valérian and Laureline. I was ten years old. Every Wednesday there was a magazine called Pilote in France, and there was two pages of Valerian every week. It was the first time I’d seen a girl and a guy in space, agents travelling in time and space. That was amazing. The past is written. The present? We have to deal with it. But the future is a white page. So I don’t understand why people on this white page are putting all this darkness. God! Let’s have some color! Let’s have some fun! Let’s at least imagine a better world. Maybe we won’t be able to do it, but we have to try. The industrial revolution changed all of this. For the first time in human history, the pace of technological change was visible within a human lifespan. It is not a coincidence that it was only after science and technological change became a normal part of the human experience, that time travel became something we dreamed of. Time travel is actually somewhat unique in science fiction. Many core concepts have their origins earlier in history. The historical roots of the concept of a ‘robot’ can be seen in Jewish folklore for example: Golems were anthropomorphic beings sculpted from clay. In Greek mythology, characters would travel to other worlds, and it’s no coincidence that The Matrix features a character called Persephone. But time travel is different. The first real work to envisage travelling in time was The Time Machine by HG Wells, which was published in 1895. The book tells the story of a scientist who builds a machine that will take him to the year 802,701 – a world in which ape-like Morlocks are evolutionary descendants of humanity, and have regressed to a primitive lifestyle. The book was a product of its time – both in terms of the science played upon (Charles Darwin had only published Origin of the Species 35 years earlier), and the racist attitudes: it is speculated that the Morlocks were inspired by the Morlachs, a real ethnic group in the Balkans who were often characterised as “primitive”. But of course, this was science fiction – what about science fact? The two have always been closely linked, and during the early days it was no different. In 1907, the physicist Hermann Minkowski first argued that Einstein’s Special Relativity could be expressed in geometric terms as a fourth dimension (to add to our known three) – which is exactly how Wells visualised time travel in his work of fiction. The development of Special and then General Relativity was significant as it provided the theoretical backbone for how time travel could be conceived in scientific terms. In 1949 Kurt Gödel took Einstein’s work and came up with a solution which as a mathematical necessity included what he called “closed timelike curves” – the idea that if you travel far enough, time will loop back around (like how if you keep flying East, you’ll eventually end up back where you started). In other words, using what became known as the Gödel Metric, it is theoretically possible to travel between any one point in time and space and any other. There was just one problem: for Gödel’s theory to be right, the universe would have to be spinning – and scientists don’t believe that it is. So while the maths might make sense, Gödel’s universe does not appear to be the one we’re actually living in. Though he never gave up hope that he might be right: Apparently even on this deathbed, he would ask if anyone has found evidence of a spinning universe. And if he does ever turn out to be right, it means that time travel can happen, and is actually fairly straightforward (well, as far as physics goes anyway). Since Gödel, scientists have continued to hypothesise about time travel, with perhaps the best known example being tachyons – or particles that move faster than the speed of light (therefore, effectively travelling in time). So far, despite one false alarm at CERN in 2011, there is no evidence that they actually exist. Of course, the lack of real science when it comes to time travel has not stopped some people from claiming to have done it. With the likes of Marty McFly and Doctor Who on the brain, chancers and hoaxers have realised that time travel is immediately a compelling prospect. Here’s a couple of amusing examples. At the turn of the millennium, when the internet was still in its infancy, forums were captivated by the story of John Titor. Titor claimed he was from the year 2036, and had been sent back in time by the government to obtain an IBM 5100 computer. The thinking appeared to be that by obtaining the computer, the government could find a solution to the UNIX 2038 bug – in which clocks could be reset, Millennium Bug-style, leading to chaos everywhere. Posting on the ‘Time Travel Institute’ forums, Titor went into details on how his time machine worked: It was powered by “two top-spin, dual positive singularities”, and used an X-ray venting system. He also gave a potted history of what humanity could expect: A new American civil war in 2004, and World War III in 2015. He also claimed the “many worlds” interpretation of quantum physics was true, hence why he wasn’t violating the so-called “grandfather paradox”. Titor claimed he was from the year 2036, and had been sent back in time by the government to obtain an IBM 5100 computer. Okay, so he probably wasn’t a real time traveller, but in the early days of the internet, when anonymity was more commonplace, he truly captured the imaginations of nerdy early adopters who perhaps, just a little bit, hoped that he might be the real thing. More recently, in 2013, an Iranian scientist named Ali Razeghi claimed to have invented a time machine of sorts. It was supposedly capable of predicting the next 5-8 years for an individual, with up to 98% accuracy. According to The Telegraph, Razeghi said the invention fits into the size of a standard PC case and “It will not take you into the future, it will bring the future to you”. The idea is that the Iranian government could use it to predict future security threats and military confrontations. So perhaps it is time to check in and see if he managed to predict Donald Trump? So is this the best we can do? Will we ever manage to crack time travel? Some scientists are still sceptical that it could ever be possible. This includes Stephen Hawking, who proposed the ‘Chronology Protection Conjecture’ – which is what it sounds like. Essentially, he argues that the laws of physics are as they are to specifically make time travel impossible – on all but “submicroscopic” scales. Essentially, this is to protect how causality works, as if we are suddenly allowed to travel back and kill our grandfathers, it would create massive time paradoxes. Hawking revealed to Ars Technica in 2012 how he had held a party for time travellers, but only sent out invitations after the date it was held. So did the party support his argument that time travel is impossible? Or did he end up spending the evening in the company of John Titor and Doctor Who? “I sat there a long time, but no one came”, he said, much to our disappointment. Huge thanks to Stephen Jorgenson-Murray for walking us through some of the more brain-mangling science for this article. Time travel might be one of the most popular themes of science fiction, but did you know that time travel to both the past and future, of a sort, is also something we experience every day of our lives? This might sound absurd, but here is how it works, along with some examples of how it effects our everyday lives. Travelling back in time is impossible due to the fact that it would violate the law of causality. The famous grandfather paradox, for example, postulates that, if you travelled back in time and killed your grandfather, you would never have been born, so you could never have gone back in time and done it in the first place. Looking back in time, however, is something you do every time your eyes are open. Everything that we see is due to light and light has a finite speed. Absolutely nothing in the Universe can travel faster than light, which travels at a speedy 186,000 miles (300,000 km) per second. This means that everything you see is as it was at the time light left that object whether reflected or directly from a light source. Here on Earth, an extremely small place in the Universe, it is not possible to provide some practical examples of how backwards time travel works. To provide some examples which most people can relate to, let’s take a look up at the night sky. The moon is approximately 235,000 miles (380,000 km) away. This means that it takes light 1.3 seconds to bridge the gap between the moon and Earth. Every time you see the moon, you are seeing it as it was 1.3 seconds ago. Let’s use the Sun as an example. This is much, much further away from the moon, being at a mean distance of 93 million miles (150 million km) from Earth. It takes light from the Sun 8 minutes and 20 seconds to reach us. If the Sun suddenly vanished out of existence, it would still be there in the sky for that amount of time after its disappearance. The stars are another matter. Vastly further away than the Sun, the nearest star to Earth other than our own, is Alpha Centauri, at a distance of 4.3 light-years. This means that it takes light 4.3 years, even at its immense speed, to cross the void all the way to Earth. Astronomers uses the very fact that, the further away something is, the further we can see back in time. This is how we know so much about the early universe and how things like stars and galaxies form. The most distant objects in the night sky which can be detected by telescopes are those which have been around for enough time that their light has managed to reach us. These objects are around 13.3 billion light-years away from Earth. Things much further away than that simply aren’t visible yet, since their light is still making the unimaginably long journey to us. We have no idea where these distant objects in the night sky are today, since we can only see them where and how they were 13.3 billion years ago. We are moving through the fourth dimension, that being time, constantly. However, what if you want to travel to the future ahead of everyone else and see what the world will be like in, say, twenty years from now? Is it possible? In short, yes, it is. When it comes to explaining how time travel to the future works, we need to look to a phenomenon called time dilation, part of Einstein’s famous theory of relativity. To put it as simply as possible, time dilation means that, the faster something moves, the more time slows down. Gravity also exerts forces on time as well as space by speeding things up the closer they are to a gravitational force. A higher gravitational force causes things to orbit an object at a higher speed. The orbital speed of any object, such as a planet or moon, is dictated entirely by the average distance of the object from its primary and the mass of both objects. The effect becomes particularly extreme with things like black holes. These are dead stars which exert such a strong gravitational force that even light cannot escape the surface. If you were to orbit close to the event horizon (the point of no return at which even light cannot escape), you would be moving around it at such an immense speed that, while the speed of time would not change from your point of view, time would pass much quicker on Earth. As you move towards the event horizon, your speed will increase and time will move slower. At one point near the event horizon, you would be spinning around it at 0.999 percent of the speed of light. Stay there for one year and, back on Earth, over 22 years will have passed. Some other relativistic effects that you will experience at this speed is that your mass would increase 22 fold while your length in the direction you’re travelling would decrease 22 fold. Of course, since this would not be very good for your health, it is impossible to go too close to such a powerful gravitational source without being ripped apart. The speeding up of time that is time dilation is something that effects something that many of us use regularly – GPS navigation systems. When we use a GPS navigation system, such as those on a TomTom or a high-end smartphone, we need to wait for the device to locate three GPS satellites orbiting the Earth in order to triangulate our position and then guide us along. GPS satellites, partly in order to reduce the effects of gravitational time dilation, orbit in medium Earth orbit at a distance of 12,550 miles (20,200 km) from the surface and so their orbital speed is lower, being about 8,640 miles (13,900 km) per hour. Objects can only travel slower or faster than their natural orbital velocity by using some method of propulsion. Because someone on Earth using his or her GPS navigation system is moving relatively slowly, the atomic clocks on board the GPS satellites are running faster than clocks back on Earth. The difference is only a tiny fraction of a second but, in order to keep the GPS network running reliably and accurately, the entire system needs to make allowances for the effects of time dilation and the clocks need to be calibrated accordingly. Another example of time dilation can be drawn from the International Space Station, which orbits in low Earth orbit at a distance of 250 miles (400 km), far closer than GPS satellites. The orbital speed in low Earth orbit, for example, is between about 15,430 to 17,650 miles (24,800 to 28,400 km) per hour, depending on the exact distance from Earth. Thanks to this speed, ISS personnel also get to enjoy some 15 sunrises and 15 sunsets per 24 hours! Astronauts on the ISS often stay on board for six months at a time. When they come back to Earth, they are about 0.007 seconds younger than they would have been if they had stayed on the ground. It might not sound like much, but it does prove that time travel to the future does exist, even in practical terms. Some physicists are convinced that time travel is possible. A group of scientists from the University of Queensland, Australia, have simulated how time-travelling photons might behave; suggesting that, at the quantum level, the grandfather paradox – which makes time travel impossible – could be resolved. The study used photons – single particles of light – to simulate quantum particles travelling back through time. By studying their behavior, the scientists revealed possible strange aspects of modern physics. “The properties of quantum particles are ‘fuzzy’ or uncertain to start with, so this gives them enough wiggle room to avoid inconsistent time travel situations. Our study provides insights into where and how nature might behave differently from what our theories predict,” said co-author Professor Timothy Ralph. In the simulation, the researchers examined the behavior of a photon traveling through time and interacting with its older self. In their experiment they made use of the closely related, fictitious, case where the photon travels through normal space-time and interacts with another photon that is stuck in a time-travelling loop through a wormhole, known as a closed timelike curve (CTC). Simulating the behavior of this second photon, they were able to study the behavior of the first – and the results show that consistent evolutions can be achieved when preparing the second photon in just the right way. Wormholes are theoretical tunnels that create shortcuts in space-time. 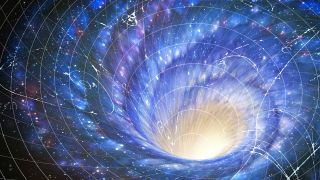 A study in May from Dr Luke Butcher at Cambridge University argued that if a thin wormhole stayed open long enough, people could send messages through time using pulses of light, or photons. Because of Albert Einstein’s well-tested theories of special and general relativity physicists believe time travel is possible. Special relativity posits that space and time are aspects of the same thing, known as the space-time continuum, and that time can slow down or speed up, depending on how fast you are moving, relative to something else. General relativity suggests that it would be possible to travel backwards in time by following a space-time path, i.e. a CTC that returns to the starting point in space, but arrives at an earlier time. In 2012, physicists David Wineland and Serge Haroche shared the Nobel Prize in physicsfor demonstrating how “quantum weirdness” could not only exist at the subatomic micro-world level, but also show itself in the macro-world. “The question of time travel features at the interface between two of our most successful yet incompatible physical theories – Einstein’s general relativity and quantum mechanics. Einstein’s theory describes the world at the very large scale of stars and galaxies, while quantum mechanics is an excellent description of the world at the very small scale of atoms and molecules,” said Martin Ringbauer, a PhD student at UQ’s School of Mathematics and Physics and a lead author of the paper. With several physical problems and paradoxes, is it really possible to go backwards through time? In a new BBC documentary, astrophysicist Stephen Hawking suggests that it simply isn’t possible to go back in time. And there’s not much to look forward to, either. Nonetheless, advances in quantum theories could perhaps provide some understanding of how to overcome time travel paradoxes. This Article (Australian Scientists Prove Time Travel Is Possible) is free and open source. You have permission to republish this article under a Creative Commons license with attribution to the author and AnonHQ.com. How would you like to meet a real unicorn? Imagine riding on his back as he flies to the stars. Well, Gloria, from “Gloria and the Unicorn” gets to do just that. However, her life doesn’t start out as happy. While giving birth, her mother died and Gloria was abruptly pulled from the womb. That’s why Gloria’s face is droopy on one side. Unable to care for the child, her father gives Gloria to a children’s home where she overhears a conversation about herself that causes her pain to deepen. She is kept out of school to protect her from bullies, but all the young girl wants to do is learn to read. But her life takes a turn for the better after her wish to meet a magical unicorn comes true. Sir Louie, the kind unicorn, shows up and helps her to understand the truth and to believe in herself. He also teaches her to read in a magical way, a method that lets them travel into the stories. So, you see, time travel is inevitable when you mix the natural world with the magical. Sir Louie lives in Faralee—a land in which time doesn’t seem to exist. Fairies are his friends and all they do every day is laugh and play all day. But, something inside of him pulls him to Gloria. You ask why? Well any child knows that a unicorn’s role in life is cheering up sad humans. The problem is how to travel across the time/space continuum from Faralee to Gloria. Skipping ahead, Sir Louie finally meets Gloria and they jointly travel into the books they’re reading; trips that take them through the time/space continuum. This activity seems harmless enough but eventually they come to the attention of the Wicked Wizards of Malcadore. Their instinctive prime directive is to hate humans with magical powers. The Wizards realize that Gloria’s powers could ruin them so they hatch a plan to capture Sir Louie and Gloria. To find out how an unlikely duo, Gloria and Sir Louie survive the Wizards’ evil plans, I guess you’ll have to read “Gloria and the Unicorn”—a children’s book for ages 7-10. Author Don CanaanPosted on May 16, 2017 May 16, 2017 Leave a comment on Due to unforeseen circumstances….